Previous post: The Cat House on the Kings-Never A Dull Moment! Turbo is an animated film about snails and how the snail Turbo (voice by Ryan Reynolds) desires to race like the race car drivers he watches on TV in the garage where they live. Instead, he has to work with the other snails in the tomato garden, which he does not find fulfilling. On top of that, the other snails give Turbo a hard time for his dreams to race and put him down. However, one day his world changes when he has an accident that leads him to be sucked into a speeding car and he is changed by the nitrous oxide into a fast snail. Turbo and his brother Chet end up captured by Tito who works at a taco truck with his brother but he also races snails on the side. Tito and Turbo end up becoming friends and Tito enters Turbo in a real car race, Indianapolis 500. He has many more adventures and makes friends along the way. 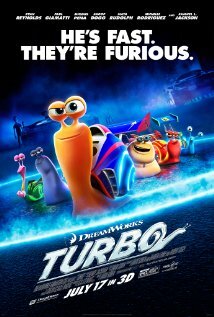 Turbo is a fun animated film for the whole family though it is more geared towards children then adults. Though something of interest that may bring adults to see Turbo is that Kim Ly, an elderly lady, is voiced by Ken Jeong from the popular TV show Community. Ken Jeong says this is the first film he has been in that his children can go see. Turbo is definitely a unique story and the only time I will ever see cute snails. Turbo is currently playing at Dinuba Platinum Theatres 6, also in 3D. Showtimes can be found on their website. Platinum Theaters Dinuba 6 now proudly presents digital quality films in 2-D and 3-D with 5.1 Dolby digital surround sound to maximize your movie experience. I do not have words to describe my feelings after watching the movie. Turbo is simply amazing. Everyone should watch it!